Do you really believe the Nicene Creed? I just finished Dallas Willard’s book The Divine Conspiracy. I recommend it highly! In that book, he poses us the question — Do we truly believe that Jesus is who we say He is? If we really did, wouldn’t we act a bit differently? Certainly, we give mental assent to the propositions of the Creeds and of our denominational confessions or the doctrinal statements of ecumenical councils. Yet shouldn’t such shocking, earth-shattering truths affect how we approach life to its deepest level? Jesus is the creator of the world. How should we, then, approach his teachings? Clearly as the teachings of the greatest moral philosopher who ever lived! And we should take them to heart. We should try to understand what they mean and how we can live by them. We should spend time reading through the Scriptures, especially the Gospels, to have these teachings of His imprinted on our hearts. Should we not memorise and meditate upon the Lord’s Prayer? Should we not read over and over the Sermon on the Mount? 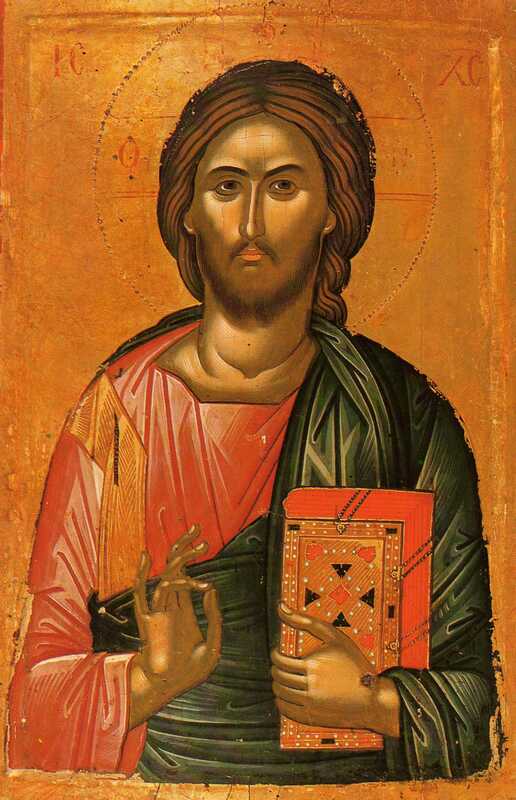 Jesus is not an intellectual, theological proposition — although these can be made about Him. He is the most wondrous, powerful, beautiful, intelligent person in the universe. He is so loving that he chose to set aside His natural form of godliness and take on our form, that of a slave. And His immediate followers tell us that our attitude, our life, should be modelled on his. That’s right, my friends, today is the feast day of jolly old Saint Nicholas–or, as the Eastern Orthodox call him, “Our Father Among the Saints, Nicholas the Wonderworker.” People these days seem to doubt that he ever existed, but considering that his bones were buried in Myra itself before being stolen by some Italian merchants and taken to Bari, I cast a vote in favour of his being real. The Catholic Encyclopedia says that all we can be certain of is that he was Bishop of Myra in the fourth century. The reason I think most people doubt his existence is the fact that, like St. George, he is most famous for the sort of thing modernists aren’t in favour of believing. In poor St. George’s case, it was because he had the terrible misfortune of slaying a dragon, the sort of thing that one really ought to leave up to mythological heroes, so people doubt he existed, even though the bulk of his story deals with his torture and martyrdom. ii. Giving money to three daughters of a man who couldn’t afford dowries. The legend says something or other involving chimneys and stockings. According to abbamoses.com, he threw the money through the window because he was trying to give it in secret. The Catholic Encyclopedia doubts he was at Nicaea in AD 325, whereas abbamoses says he was. I think he was but have no scholarly reason why. * The Orthodox tradition says that he approached Arius in the council and slapped him on the face for saying such blasphemies regarding Christ (Arius denied the divinity of Christ). The other bishops, while the agreed with St. Nicholas’ sentiment, felt that this was not entirely the way to go about things at the council, so they put him in prison overnight as punishment. As the story goes, he had a dream that night of Christ and the Blessed Virgin Mary. The Blessed Virgin gave him the bishop’s stole and Christ gave him a copy of the Gospels, the symbols of a bishop’s authority. When they came to let him out the next day, they found him with these objects in reality. The miracle confirmed St. Nicholas’ righteousness and the truth of Christian orthodoxy. Who knows if it’s true or not. But if St. Nicholas of Myra was in Nicaea in 325, he is in part responsible for something much bigger and better than hopping on a sleigh with 8 or 9 flying reindeer and bringing baubles and toys for the greedy children of the world. He would have helped craft this, which was later revised as this. *His name does not appear on any of the earliest lists of bishops at the council. Therefore, there is no historiographical reason to assume his presence. However, it is difficult to know who exactly was present at Nicaea, because we have no actual Acta as we do for later councils such as Chalcedon (451). “Or Eusebios still plays at politics,” responded Eustathios. “Let us be charitable, brother,” chided Makarios gently, a smile playing on his lips. Eustathios stood. Assembled were many, many overseers. The council was drawing to a close. The proposed formula would set a standard for the Assembly; if one disagreed, then one was not following the true and right teaching handed down from the apostles. Nikolaos, Spyridon, Alexandros of Alexandreia, Aurelianos, Vitos and Vikentios the legates from Roma, Hosios of Cordoba, an elderly woman who always caught his eye, someone who looked suspiciously like Metrophanes of Byzantion (Eustathios had heard that Metrophanes was too ill to travel, like Father Silvester), Arios himself, and Konstantinos all looked at him. Konstantinos nodded. “Thank you,” Eustathios sat back down. The Metrophanes-like man was clapping quietly in the corner. “Let us go with that of Overseer Eustathios,” stated Spyridon. And in one Lord Jesus Christ, the Son of God, begotten of the Father, only-begotten, that is, of the substance of the Father, God of God, Light of Light of Light, very God of very God, begotten not made, of one substance with the Father, through whom all things were made, things in heaven and things on the earth; who for us men and for our salvation came down and was made flesh, and became man, suffered, and rose on the third day, ascended into the heavens, is coming to judge living and dead. And those that say, “There was when he was not,” and “Before he was begotten he was not,” and that, “He came into being from what-is-not,” or those that allege, that the son of God is “Of another substance or essence” or “created” or “changeable” or “alterable,” these the Universal and Apostolic Assembly anathematizes. Some stayed in Nikaia for Konstantinos’ twentieth anniversary celebrations. The more monkish went home immediately. Many thought it was over, that Arios and falsehood had been cleansed from the Assembly. It was only just beginning. *Henry Bettenson, Documents of the Christian Church, 2nd ed. Oxford: Oxford University Press, 1963, pp. 24-25. **J. N. D. Kelly, Early Christian Creeds, 2nd ed. London: Longmans, 1960, pp. 184-185. The creed is the creed of Antioch as quoted by John Cassian up to “living and dead.” After that, it is the creed of Jerusalem. Kelly notes that Cassian’s creed, quoted in 430/31, has had Nicene phraseology added to it (185). The creed of Jerusalem, however, is “of fairly early date” (183). All three creeds are ancient baptismal formulas, just like the West’s “Apostle’s Creed.” That Sts. Macarius and Eustathius were working together in creedal formulation behind the scenes, see The Catholic Encyclopedia. A few weeks ago, I had the “opportunity” to stand in a doorway and discuss the Bible and Christology with a couple of Jehovah’s Witnesses as the floodgates of Heaven opened outside. What stood out to me as we talked was how truly Arian their Christology is. They encouraged me to read Proverbs 8:22-31 (“The LORD possessed me [Wisdom] at the beginning of his way …”) and tried convincing me that when the Word of John 1 is called “god” this doesn’t mean the same thing as the God with whom the Word is. I did my best to pull out some St. Athanasius — Jesus is the only-begotten Son of the Father. If like begets like (“Do you have a son? Is he of the same nature as you?”), and the Father is God, then God begets God, so the Son must be God. I also used the analogy of the sun and its rays being different but the same and one being incomplete without the other. That analogy breaks down — as well it should, for God is the Creator and entirely different from His creation. St. Athanasius was an appropriate choice to use in debate with the Jehovah’s Witnesses because he spent most of his ecclesiastical career arguing against the heresy of Arianism. St. Athanasius (c.296-373) is one of the Four Doctors of the Eastern Church. He was born of Christian parents of Egyptian, not Greek, descent, and educated in the Greek Christian catechetical school in Alexandria. He was present at the Council of Nicaea in 325 as a deacon and witnessed firsthand the debates about the divinity and eternity of Christ (Arius’ famous one-liner: “There was when he was not.”). This is the Council that gave us that famous Creed that forms the basis of what we recite in churches around the world today (my translation here). St. Athanasius was to spend the rest of his life combatting the teachings of the Arians and the Semi-Arians (or “homoiousians“), especially following his consecration as Bishop of Alexandria in 328. He did his best to be a pastoral bishop, but constantly found himself running into heretical Arians or schismatic Meletians who were out to get him. These run-ins, such as the Council of Tyre, had a tendency to end up with him in exile. He was in exile in Trier (335-7), Rome (339-46), and the countryside around Alexandria (356-61, 362-3, 365-6). While in exile within Egypt itself, he had occasion to take refuge with the nascent monastic movement that was flourishing at this time (ie. The Desert Fathers), encountering St. Antony about whom he would write one of the most influential works of hagiography (available in Carolinne D. White, Early Christian Lives ). His time spent in the West meant that the links between East and West were strengthened. The Bishops of Rome during his episcopate (St. Sylvester I, St. Marcus, St. Julius I, Liberius, and St. Damasus I) were supportive of his teachings and polemic against Arianism. Much of St. Athanasius’ work was translated into Latin, and he is one of the better-known Eastern Fathers in the West as a result of his time there and papal connections. His theological works are focussed largely on the Person of God the Son, as seen in De Incarnatione Verbi Domini (On the Incarnation ) and in his famous Contra Arianos. One result of St. Athanasius’ reasoning about the Person of God was the statement that the Bible names God as Father. This means that ontologically (ie. at the very root of Who God Is) God is Father. Since God is eternal and unchanging, He will always have been Father. One cannot be a father without offspring; God, therefore, begets the Son in eternity; God the Son is therefore eternal. The implications for understanding Who God Is and what personhood is are far-reaching (see J.D. Zizioulas, Being As Communion , chh. 1-2). St. Athanasius, like most of the Fathers, was not just a theologian, not just a pastor, not just a preacher. He was also a believer in the life of holiness. This was the root of his support of the monastic movement, for it is with the monks that we see the enduring persistence of costly grace (see D. Bonhoeffer, The Cost of Discipleship , ch. 1). We are reminded that orthodoxy and orthopraxy are not to be divorced. We are to think holy thoughts and live holy lives, worthy of the calling to which we are called. St. Athanasius fell asleep on May 2, 373. May we be half as vigorous in our defence of Truth as he. Further Reading: Christopher A. Hall’s two books Reading Scripture With The Church Fathers and Learning Theology With The Church Fathers both deal with St. Athanasius. I also recommend reading On the Incarnation as an entrance both to Athanasius and Patristic theology. I preached a shortened version of this sermon at Evensong at St. Alban’s Anglican Church, Ottawa, Ontario, on December 28, 2008. The preaching began with a reading of the hymns by Ephrem the Syrian quoted in my last post. It is Christmas. I hope to share with you in this homily some thoughts on the ineffable mystery of Christmas. The elusive “true meaning” of Christmas that every Christmas special seeks to hunt down is bigger than Santa, gifts, family, friends, carols, winter, snow or anything else that we human beings do. The true meaning of Christmas, dear friends, is that of the Incarnation, as St. Ephraim says, “the God-man.” It is this theological mystery I hope to investigate tonight. People are often afraid of theology, and I’ll skip over a lot of jargon; I’ll use Scripture, hymns, creeds, the Fathers, etc, to bring out the beauty of the mystery of Christ’s Incarnation—with the understanding that the hymns, Fathers, creeds, etc, are in accord with Scripture. When we see the beauty and glory and magnificence of this event, I hope that we will be drawn to worship and prayer. True worship of the true God is the ultimate goal of all proper theology. Diadochus of Photike says, “Divine theology brings into harmony the voices of those who praise God’s majesty.” Similarly, Evagrius Ponticus declares, “If you are a theologian, you will pray truly. And if you pray truly, you are a theologian.” Worship and prayer are vitally important; both fuel us and drive us into action; may we thus also live better lives in the light of the truth of Christmas, when God came down and lived amongst us. 1. What God is Jesus? The Creator God. God. Jesus is fully God. He is not some lesser being, some semi-divine creature, or an angelic being. He is God Himself. This is a mystery. We cannot penetrate into the fullness of its glory. Indeed, it boggles the mind to think on it: God in the flesh! There is so much that could be said about the God Who Jesus is—he is the God of the Old Testament, He set the people of Israel free from Egypt, He spoke by the prophets, He gave the law, He showed Moses a glimpse of His glory. Let’s reflect for a moment on the fact that He is the Creator God. God, according to Genesis 1, created everything. He spoke, and it happened. God said, “Let light come into being, and there was light.” Since God created using speech, it comes as no surprise that we read in John 1, “All things were made through [the Word], and without Him nothing was made that was made.” (NKJV) Jesus, the Word, created. He is the living Word of God the Father, and He brought all things into existence. He is the One Who creates out of nothing. Before we rush off into these heights of glorious truth, let us recall the title of a book I once read, Jesus with Dirty Feet. This Jesus we read of in the Gospels, the One with dirty feet, Who walked the shores of Galilee, Who threw the moneychangers from the Temple, Who wept at Lazarus’ death, Who told stories, Who was born a Babe in Bethlehem and laid in a manger by His mother—this Jesus happens also to be the Creator of the Universe. This Creator God took on flesh at Christmas. He was born of a Virgin as an infant. The mind that hung the Pleiades in the sky was incapable of expressing itself in words and lived off the very milk of a woman whom He created. Mindblowing. Briefly, let us remember that the Creator God has a specific character and history as revealed in the Old Testament; and Jesus, the Babe of Bethlehem, is that God. In fact, some of the early Church Fathers taught that the Word of God, Jesus, is the God who speaks in the Old Testament. I’m not sure I agree, but the implications are that the Second Person of the Trinity is the One Who once on Sinai’s height did “give the Law in cloud and majesty and awe”; He spoke to Elijah in the still small voice on Mt. Carmel; He visited Abraham and Sarah; He spoke to Isaiah, Jeremiah, and all the prophets. This God we worship in Jesus is not just a speaker and Creator. He doesn’t just order the cosmos and talk to us every once in a while. He acts. Remember our Sunday School Bible stories: He brought Noah’s flood, He led the people of Israel out of Egypt into the Promised Land, He caused the walls of Jericho to fall down, He gave Samson superhuman strength, He gave Solomon wisdom, He consumed the offerings that Elijah gave on the altar with a mighty flame, He saved Shadrach, Meshach, and Abednego in the fiery furnace. The holy God of Israel, Who meets Moses in the burning bush and declares His Divine Name, “I am that I am,” manifests Himself as Jesus. He is just, righteous, jealous for His holy Name, compassionate and merciful. Anything we can say about Almighty God we can say about Jesus. This means also that, in the New Testament, when John says that God is Love, the same applies to Jesus. That God is Love helps unlock the mystery of why this God of power and might would choose to humble Himself as a poor infant, born into this world not into the halls of kings or emperors but into a manger of all places!